"Meaningful change ain't gonna happen for our kids if we're not willing to invest in it for ourselves first. At the heart, it's not about schools... it's about us"
For obvious reasons, I don't believe there is a better way to introduce the Technasium, then to quote Will Richardson first. An educator who has continuously promoted & demonstrated the advancement of education technology in our classrooms, and its benefits for our students; it just seems like the right place to start. I was struck when I saw that quote because of its direct connection to a new initiative a group of us have started this year to hopefully improve educational/instructional technology adoption and use in our school. We have termed this initiative the Technasium, and believe it will provide educators an opportunity to 'just play'. Well it's really just a room like any other; a former classroom that was rarely used. However, it is now a classroom that houses a piece of every technology we offer at our school for staff to use (i.e. Smartboard, PC's, iPads, etc.) It is open every period of every day, so that staff can come in and prepare lessons using the technology they have available to them. It provides an environment for staff where they can mess around with the technology without any judgement, pressure, or time constraints. There are no students around, and so the opportunity to learn outside of the typical classroom is now available to them every day. Two of the main obstacles that we have found when it comes to the adoption of edtech into lessons are time and availability. Many teachers have said they just don't have the time to try out a new piece of software, hardware, or other piece of technology; and if they do, they just don't have a space to try it out in (availability). Many of us, myself included, don't feel like trying out a website for the first time in the class with the actual students - plenty of problems may arise, and there we are standing at the front of the classroom wondering what to do next?! 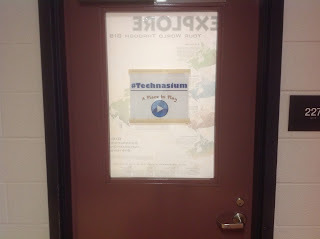 Therefore, with the Technasium, staff are able to access any web 2.0 tool, software, or hardware (a simple printer even) so that they can begin to integrate technology into their lessons. Our true belief is that technology should not be a side project, but integrated into every lesson; and we hope one day this may become a reality. Well that's something I don't really have the answer to. It started as a simple idea, thrown around to a couple other staff, pitched to administration, and next thing we knew we had created it. It's amazing how simple dialogue can lead to big changes and innovation. The idea of trying something new is daunting; investing a great amount of time, energy, and resources, is risky; and we have no idea what we are really doing?! We don't know what the results will show, but we do know we are not going to wait for evolution to take place on its own. We believe the only way for such a change to happen is to make an investment on our own to really push the change.